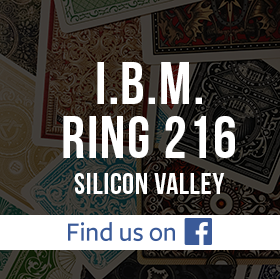 On November 12, 2014, IBM Ring 216 will hold its yearly election of officers. In addition, we will have an open performance night for members to show their new routines, along with free food. This is an opportunity for Ring members to get involved with leadership of the club. As an officer you will have a vote in the clubs direction, provide a valuable service, expand your social network, meet new magicians and have fun. All paid up Ring 216 members are invited to submit their names to also be considered as a nominee for any of the above positions. Deadline will be October 20th. Also any Ring 216 member can challenge final nominees by a floor nomination at the election. Ring membership must be validated at the election to be nominated as a floor candidate. If we have more than one nominee for a position then a secret ballet will be held to determine the winner. Fantastic event last night with over 40 plus attendees...... and with plenty of ballots for a people's choice award. Congratulations to Perry Yan for winning first place in the Standard Division close up competition and for winning people's choice! Great job by Fantastic Fred and Rafael as well. In the Masters Division, we had 4 competitors: Alan Leeds, Dan Chan, David Martinez, and John Jones. The first-place winner will be announced at the Annual Banquet in January. Will Chandler will be publishing more information on the Annual Banquet soon. A big thank you to those of you who supported this event and helped out. The November club meeting will our our annual elections for 2015 (which will be a very speedy process) and then OPEN PERFORMANCE NIGHT. Here is your opportunity to perform what you have learned and have been practicing through-out the 2014 year. Bring it! We want to see it! Sign up early by sending Cal an email (cal.tong@ring216.org). The last time we had OPN, we had more sign-ups than we had time to accommodate. The December Club Meeting will be our Annual Stage Competition! Sign up in advance by sending Cal an email!